Some little girls were made to be dancers. Some little girls were destined to be dentists. Your little girl has decided she was born to be bad. Bad to the bone. Not the bad that pulls other little girls hair, or teases the boy that is afraid of spiders. No, she heard the song Bad to the Bone once, you're not even sure where she heard it, but now it's all she wants to be. You knew she was going to be a heart breaker the day she popped out. And you weren't wrong. Her pretty eyes, the long lashes, and her beautiful brown hair, all make her one of the most beautiful people you have ever seen. And you're not just saying that because she is your kid. Plus she is so freaking smart. She can do long division, and she is only six! Let her show off her bad to the bone style with this frilly Girls Bone Costume. 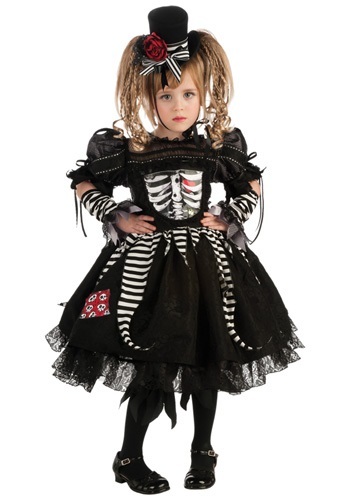 She can let everyone see just how bad to the bone she is in this dress. And she can tease all the boys in her first grade class while she is at it. Break their little boy hearts as she dances in the lacy skirt. The other girls wont even get jealous. Your girl is to likable for that. You can relish in the few years she has left of thinking boys have cooties though. As long as someone doesn’t give her a "cootie" shot.